You can return to our gazebos page or browse the pictures using the next and previous links. If you've found inspiration take a look at the gazebos section in our garden centre. 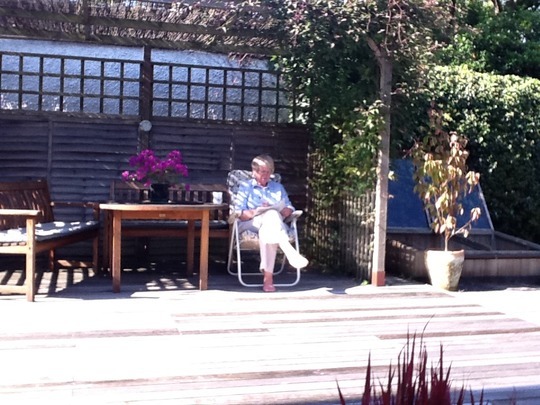 My husband took this with me unawares, doing the usual tea-time crossword in my favourite chair . . . love the shadow patterns! Where are the scones and jam Sheila?? Nice relaxing pic. Ideal! How long did it take you to finish the crossword? Your summer house is lovely, looking out into the garden and the sun. Just spotted that lovely big cold frame..wish it was mine! has it got a solar panel on the top? What a delightful spot, you have made a lovely Gazebo. Yes, that looks just lovely! A happy Sunday. Thank you so much Grandma, Sticki, Tet, Denise, Sue and Karen - it is my favourite spot! Tet . . . would you believe, the cold frame was a FREE GIFT when we bought our Alton Cedar greenhouse four years ago, in memory of my Mum. Sorry Sticki . . . no solar panel, no! And this week's crossword was mostly straightforward (the Jumbo in Saturday's Times): I prefer a bit more of a challenge really, but I do enjoy them. (oh, to answer your question, about 45 minutes?). 45 minutes!!!??? you must be a genius ~ would take me 45 weeks! definitely no hope for me then!!! i shall stick to easy sudoku, codeword ~ when its not impossible and GoY!!!!! Ah, you're running away with the thought that I was doing the "Cryptic" crossword . . . noooooooooooo, it was the General Knowledge one!! Sorry to disappoint you - I quite like the idea of being a genius, lol. either way!! wouldnt make any difference i still cant do them. think i will award you some letters: HIL ~ highly intelligent lady! I think so too..I used both the coffee time AND the cryptic in order to complete mine, two bites of the apple and still it took me ages. It's a good excuse to have a sit down, though, lol! Sticki, I don't deserve the "H" . . . "O" would fit (for "occasionally . . "), but I don't want to be OIL! That's an interesting idea - I bet we could all invent letters to put after our names. You could be Stickitoffee, G.A.C. (Gardener and Cook). What would you be, Tet? Hello, we posted together there! I could be Grandmage NST (non stop talker)!! yes GM you can have that one cos you got it in quick before my second one!!! sounds very good!! Sheila looks more LM to me sat there in the sun with her coffee (Lady Muck is really an affectionate term for someone doing and having what we would like to have and do LOL)..figure that one out!!! and of course she will now have to have LoL ~ lady of leisure!!!! I know, I know...just cant 'elp showin' me origins...or is that apples?...I do hope Sheila still speaking to me..
she wont be long ~ she is probably doing today's crossword ~ about 30 mins?? or perhaps she is thinking up a cross word for you!!! She went out shopping (not plants today since you ask), and came back and found this . . . so now she's laughing her head off! Sticki, I'm not a bowler(!) I'm a croquet player - you can definitely be NBN. Thank you Grandma ge for the W.G. suggestion, and Tet for LM. So now I'll sign off as Sheilabub, CPAILWGLMBLLOL . . . or is that a bit much? Can't do the crossword yet, Sticki - ironing to do first, then crossword and Codeword with tea. Roll on 4 o'c! i cant work that all out. thats an awful lot of ladies ~ what is the collective noun for lots of ladies??? No probs, Sticki - you're not the only one who gets them mixed up. thats very clever sheila ~ now we can see why you are so good at crosswords!! I like 'LOB' Sheila ! or maybe YOB is more like it LOL. Not sure what the Y is for though!! Whose calling me a Lazy Ole Beggar??? Tut! Wouldnt be surprised..getting lazy in my english! Didnt notice, do not worry! I agree with Lulu ... highly entertaining comments! ... Lulu, you could have M.A. after your name as Mosaic Artist rather than Master of Arts! . . . . . I suppose Mistress of Arts might be a tad suggestive?? OOh good idea Shirley, might try that one! Lol, Lulu! . . . . .
finished the crossword yet sheila? Finished on the day, Sticki, with a little help from my friends! very good!!! thats what friends are for.